Welcome! I’m Will Jones and I have recorded drum tracks for songwriters, bands and producers worldwide from my studio in Hertfordshire, UK since 2011. I focus on rock, indie and acoustic styles. Whether you’re a home recorder or a pro, my goal is to ensure that you receive drum tracks which will give your songs the lift and backbone you are looking for. I have recorded over 570 songs for over 125 customers in 19 countries! Not many online drummers have a track record which stands up like mine! 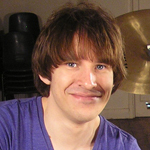 I deliver all drum tracks via email in multitrack format. In addition to having a drum kit and room optimised for recording, I have a range of gear (snare drums, percussion and sticks/brushes/rods) to ensure that I have the right tools for every session.